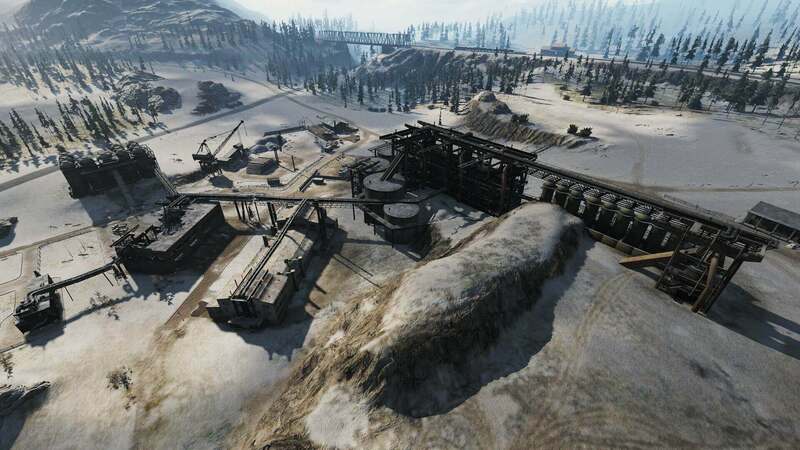 If you think winter is the time to retreat indoors with the heat cranked up, get ready for the Tier X action on Klondike. 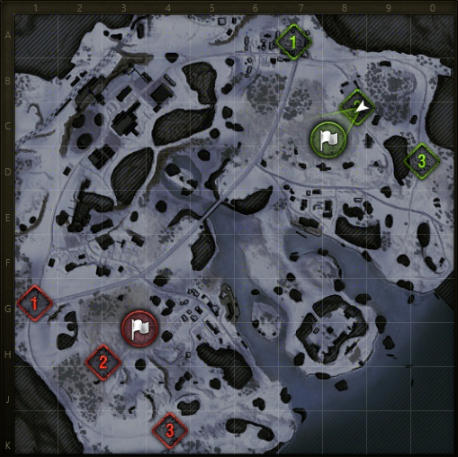 It gets real hot on this new winter map when two teams lock horns in Grand Battles. Excited? Let’s explore it together and learn how to snipe, splatter, and slay opponents battling in the deceptively serene North American wilderness! 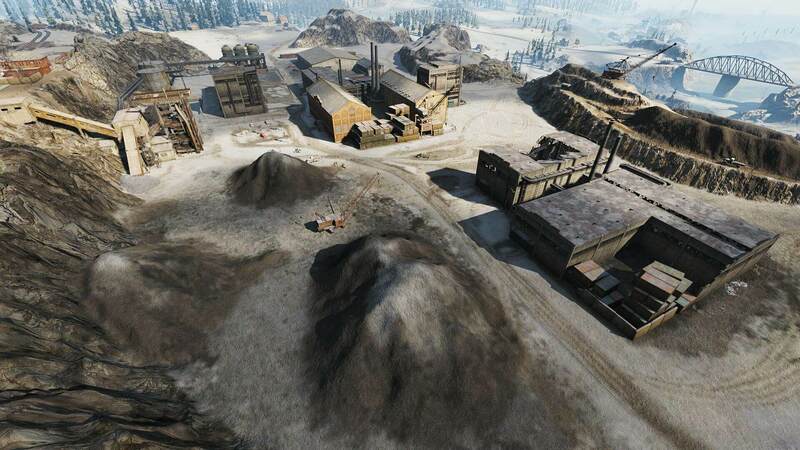 Klondike is a direct response to your requests to liven up 30v30 battles with a new map, and we hope everyone enjoys it! Community feedback will continue to fuel the evolution of Grand Battles, as we update the mode with new features and content. Inspired by the adventure writing of Jack London, Klondike brings tank battles to North America, where dirty streets and crusty clapboard buildings of a mining settlement tell the story of the Gold Rush. Don’t be distracted by the tranquility of the cold weather, though. 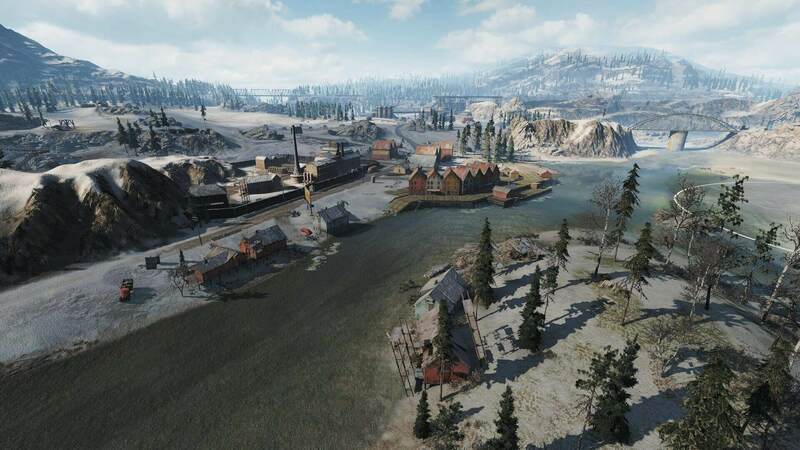 Lone cabins, snow-sprinkled hill roads, and dusty riverbanks will reverberate with the sounds of battle when a firefight is in full turmoil. 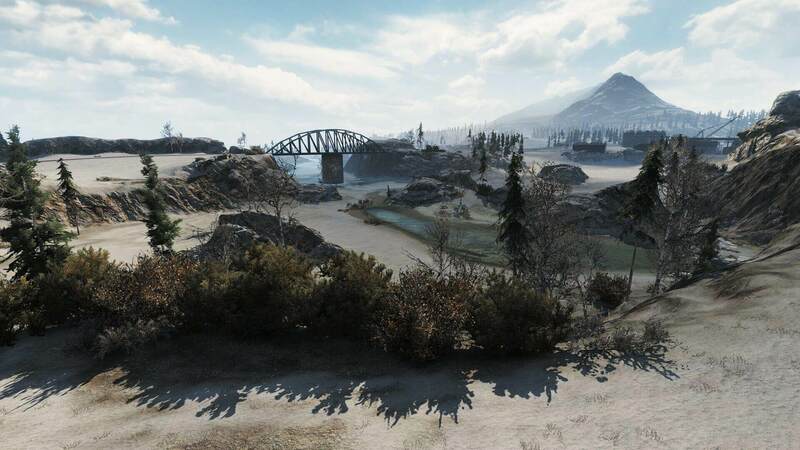 Teams start in the southwestern and northeastern corners of the map, with three spawn points each, and three routes leading to enemy territory. 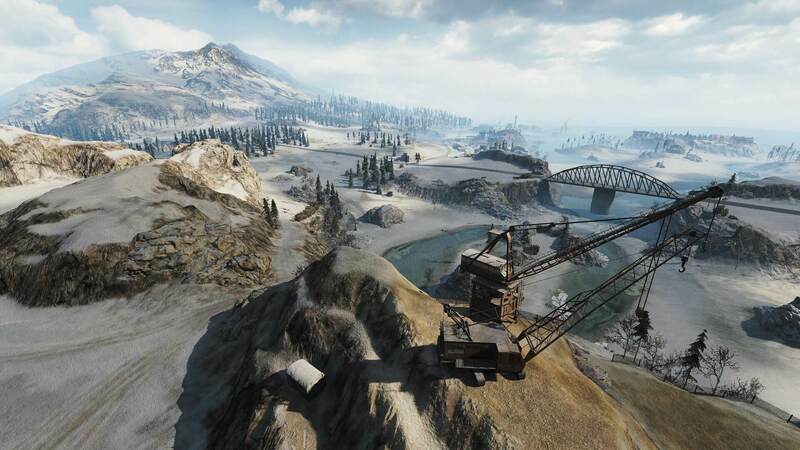 Head north to a small mining town and attack the river bridge in the center, or venture into the abandoned settlement on an island to the south. Whichever direction you defend or attack, stay focused on points of interest located in no man’s land between the two camps. Expect to battle hard for these areas: claiming them provides a tactical advantage over nearby land. Once you have control over points of interest, move on to capture the enemy’s defensive positions. 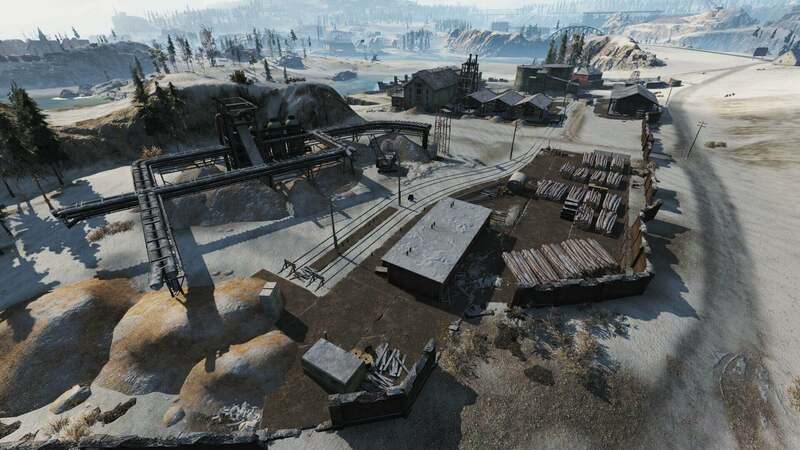 The town to the north features lots of corridors, buildings, and tight spaces, making it a go-to spot for heavy tanks and other well-armored vehicles. If you rolled into town in a heavy tank, stay alert and always keep an eye out for bypass roads. Losing sight of them might leave you under fire from a sneaky opponent who closed in and now keeps sending shell after a shell your way. Mobile medium and light tanks should stick to the bypass roads to catch enemies off guard and provide cover for allies. If playing as a scout, support the team by detecting enemies who venture to the heart of the conflict. The likes of the Grille 15 and Strv-103B can support a push by wearing down enemies from defensive positions on the map’s edges. If set up properly, snipers and SPGs that are likely to lay low there can greatly change the tide of the battle by stopping tanks dead in their tracks. 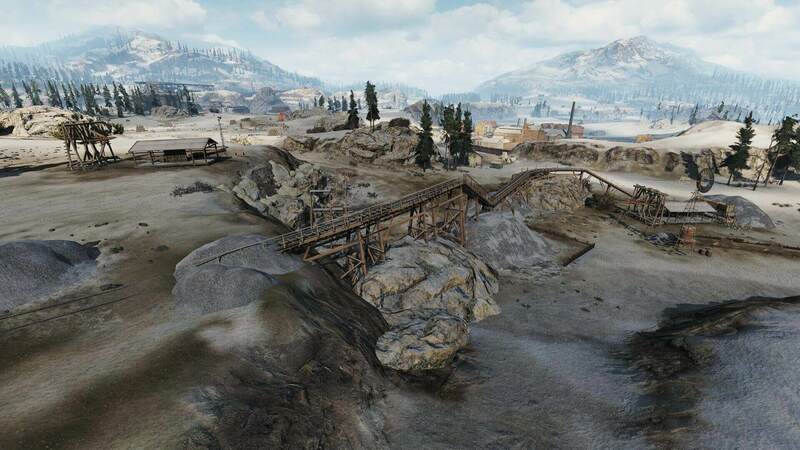 The island south of the central bridge features vast uncovered areas, speckled with miner’s cabins. It’s best suited for mobile vehicles that rarely stay put, relocating a lot and attacking enemies from afar. If you ventured into the southern flank in a heavy tank, head to the island leading the attack. If the situation calls for it, you can move to the center of the map or play in defense. Try to read enemy moves and choose what works best for you and your team. Scouts can leverage multiple open spaces to detect enemies or hug cabins and use their view range to reveal enemy positions. Medium tanks can really spread their proverbial wings by firing from behind cover or working the first line alongside heavy tanks. Support vehicles will feel at ease on the second line. Pick a tactic that best suits your play style, but generally lay low and send shots from mid-range. If you thrive on riskier maneuvers, there may be room for some hit-and-run tactics. 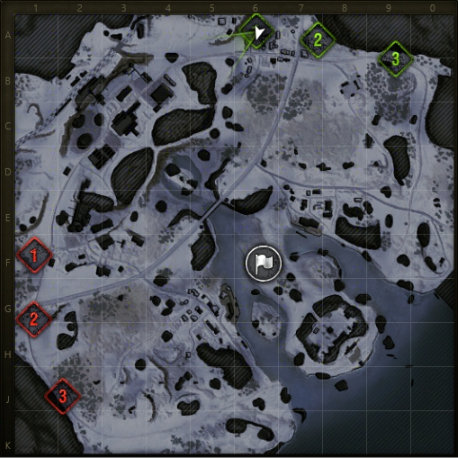 As for arty, they should keep to the third line, picking off detected enemies. The center of the map will likely be rather static until later on. At the beginning, most of the action is likely to occur on the northern and southern flanks as both teams try to conquer them to get a direct route to base. Once control of the flanks is seized, teams will channel greater forces to protect the bridge or take it over, depending on who took the flanks. If you’re a heavy tank, your task is to stifle enemy attacks. As you draw shells, support-fire vehicles can assist friendlies in the town and on the island by putting pressure on the opposition hanging around there. Mobile medium tanks can probe enemy defenses to find a breach or attack the other camp on the flanks. Scouts should stay in the field, uncovering enemy positions and hunting down enemy LTs. Rolling in solo isn’t feasible—coordinate with support fire vehicles by feeding them crucial intel. As a support vehicle or arty, always keep an eye on the minimap. Analyze the situation and provide support where it’s most needed, helping friendlies or suppressing enemy attacks. Look, I am extremely busy and I don’t really care about that dead game which had the 2.0 update ruin the experience of the old players. Considering I guess 3 people come here for WOWP stuff…. I would not waste to much focus on it either. Erhm… Are you talking about WoWP or WoWS? Make up your mind. I replied to him in the same manner. The writing of Jack London?…like as in White Fang? 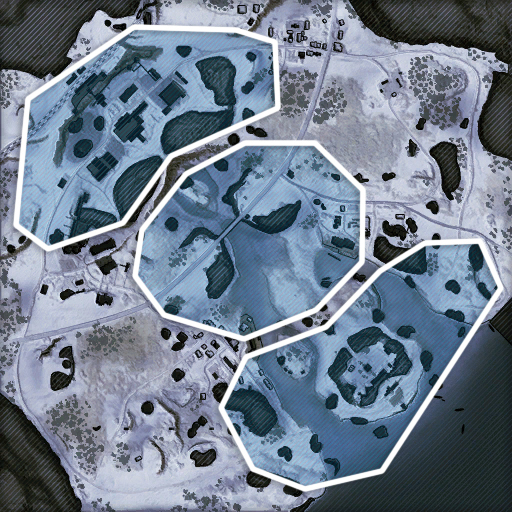 Anyone gotten this map on CT2? 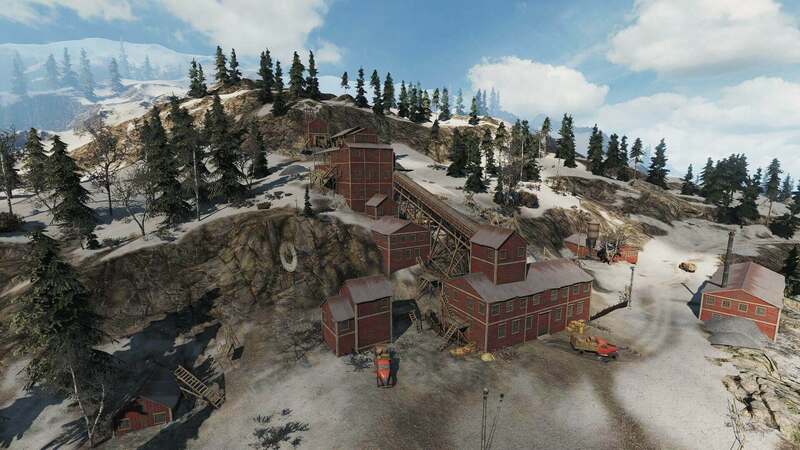 I had FPS in the low 20’s in this map on CT1. Have 110 to 127 on Live. And I did see CC’s dropping to below 30 to. I suspect they still have not fixed it. As they did talk about FPS issues on the new GB maps on the video WG posted today.